Your amateur dramatic society is gearing up for a knock-their-knickers-off performance in two months, and you're a tad worried that the seats will go unfilled. Not surprisingly, someone on your board suggests handing out free or comp (as in "complimentary") tickets to ensure a full house every night. Sounds like a great idea, right? The answer is a little bit complicated and depends upon your situation. Though giving free tickets can be an excellent way to introduce patrons to your troupe, it might not be the best solution. Here, we'll look at some times when "free" is good (even profitable!) and when it's definitely not a great way to glean support for a play, musical or reading. Situation: You are just starting out, money isn't a problem (or isn't required), and you want to showcase your amateur dramatic society's work. This is an excellent time to offer a free seating to your show. You can even do a combination of free performances and paid performances. For instance, hold one free performance on a night when ticket sales are likely to be light - such as Tuesday, Wednesday or Thursday evening. For performances on Friday and Saturday, charge a fee. Situation: You group is introducing a play that is controversial or unusual. Some plays are so off-the-wall (though interesting to the right people), avant garde or emotionally charged that ticket sales could become problematic. For those types of "offbeat" shows, you might want to consider offering free or greatly-reduced seat prices. That way, you can be ensured of at least a minimal audience for each of your performances. Situation: You want to perform to a select group of people. Perhaps you want your show to be "by invitation only". In this case, giving out free tickets to very select persons will make sense. And don't forget that those people might be willing to give a donation to your amateur dramatics society after the performance as a show of thanks. Situation: You're worried that ticket sales are low for an upcoming performance. Before handing out freebies, ask yourself if this might just be normal for the type of show you're offering (not everyone wants to go to a classical Ibsen piece) or the time of the year you're offering it. Don't be knee-jerk in your reaction to low sales; sometimes, that's just par for the course. If you start handing out free tickets every time your performances garner little audience support, you'll be starting a dangerous and potentially bank-breaking precedent. Situation: You assume that no one would pay for what you have to offer. Performers are notorious for struggling with their self-esteem; however, it's important not to let that lack of confidence spill over into decisions made by your amateur dramatics troupe. If you think no one will buy a ticket to your offerings, think again. Most shows will glean some support (even if it's minimal) as long as you've advertised to the appropriate patrons and you've made the performance accessible to the public. Situation: You don't think people can afford your ticket prices. Should this be a legitimate concern, it may behoove you to lower your prices rather than giving away tickets for free. 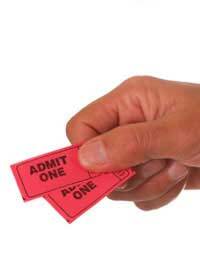 Try a reduced price ticket matinee before simply handing out freebies. That way, you'll at least be able to offset your marketing, costuming, set designing, theatre rental/lease, printing and other incurred costs.